Rev. Alexander Ortiz was born on September 2, 1950, and baptized at Our Lady of the Miraculous Medal on April 4, 1953. His first Communion in 1958 and confirmation in 1961 brought him into contact with the Redemptorists at St. Cecilia Church in Manhattan. He attended St. Mary’s Seminary in North East, Pa. Immediately after high school he attended the novitiate at Illchester, Md., making his first profession on August 2, 1969. St. Alphonsus College in Suffield, Conn., was next, with final vows on June 24, 1973. Mount St. Alphonsus followed, and he was ordained on May 30, 1976. He would have celebrated the 40th anniversary of his ordination this year. This desire to serve found him at his home parish, St. Cecilia, in September 1977, then to Holy Redeemer Parish in New York from 1978 to 1984 and St. Boniface in Philadelphia from 1984 to 1992. In 1992 his vocation took him to Boston until 1996, when the Province needed him back at St. Boniface. When St. Boniface closed in 2006, he moved to Whitestone, N.Y., until 2009. He moved to 61st Street in New York and this year to Immaculate Conception in the Bronx. Alex was a quiet person with a deep spirit of love and generosity. John Breslin shared this: “He was always a generous and friendly confrere; he was a perfect gentleman and true son of Alphonsus. One of my fondest memories of Alex was working together at Sacred Heart parish in Hartford during our ‘summer work’ my freshmen year at Suffield. He was always willing to volunteer for more than was required, and he demonstrated a great gift with children and a love of those we were serving. Rev. Michael Hopkins, C.Ss.R., lived with him at 61st Street and can never remember him complaining about his cancer or letting it slow him down, as he continued to give missions in Spanish. Father Ortiz always took care of the things that needed to be done. 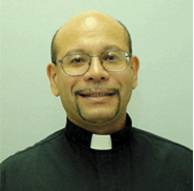 In January 1989, while he was at St. Boniface, Father Ortiz was named to the leadership team of the U.S. Secretariat for Worldwide Marriage Encounter. This automatically made him a member of the organization’s international council. He served joyfully, taking many plane trips during his four years on the secretariat. Married couples—and ways to strengthen couples’ love for each other—were dear to Father Ortiz’s heart. Rev. Gerry Brinkmann, C.Ss.R., recalls his love of the Spanish missions and the love that flowed from him to the people. They responded to his love and care. He was indeed a gentle man. He would try to be a reconciler in any dispute. Several of his former classmates have commented on what a kind person he was. Father Ortiz’s love of God was evident in all he did. He deeply cared about people.